I loved reading this. One reason because I also teach grade 3 and am going through similar ideas this year, and another reason because some of these students may be mine next year so I am happy to know what they are experiencing right now, and their thoughts on the process. In my case this year, I gradually led my students into this model of freedom. I can see benefits of diving in full blast or also setting the routines in smaller chunks first. I think the scaffolded approach I took helped my students develop the self-management skills in smaller chunks of time. Might be something to consider, but I do appreciate taking the risk and jumping in!! Are you going to continue? I look forward to working with you next year to develop these concepts further Cindy. It is a work in progress, but in my opinion we should be thinking about a consistent approach through primary that builds on each other through the grades. In addition, we should look at the POI through a skills focus, making sure they are covered through the grades, and also developing ways to teach and assess them. I also teach Grade 3, so could really identify with this post. While planning their week, I love seeing the students try out different approaches to see what works best for them. I had two boys who decided not to schedule any free play time one week. By Friday afternoon, after a week of working hard with every minute scheduled, they realised they were loosing focus and productivity and decided that next week they would plan a ‘more balanced’ week. One thing I am working on is ways to help students strengthen and deepen their daily reflections. 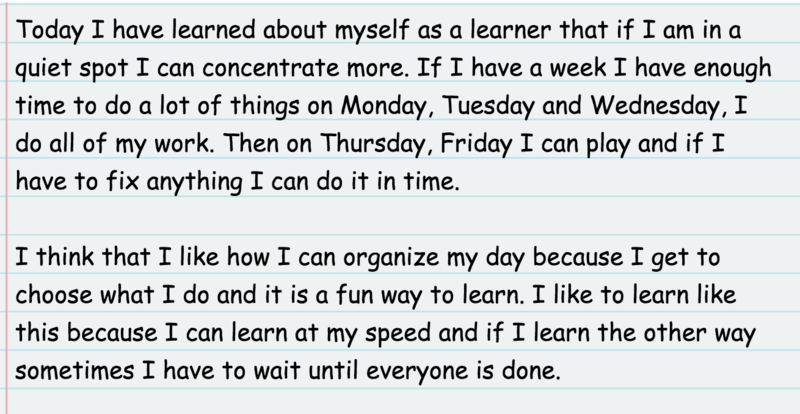 Do your students post their daily reflections on seesaw or similar? I like how you added ‘tomorrow, I can improve by..’ in your afternoon post prompts. Do you use any other prompts or tools? I am playing with the ideas of video and audio reflections and using images as a stimulus as alternatives to written reflections. Hoping this will help avoid the ‘My day was good. I did all my must do’s’ type response that slips in there from time to time. Leah, that is a really good point about the challenge of getting deeper reflections. I also find it difficult to tease out more thoughtful reflections from students. We use Seesaw for them to post their reflections and during this week I had them post in the morning and afternoon. 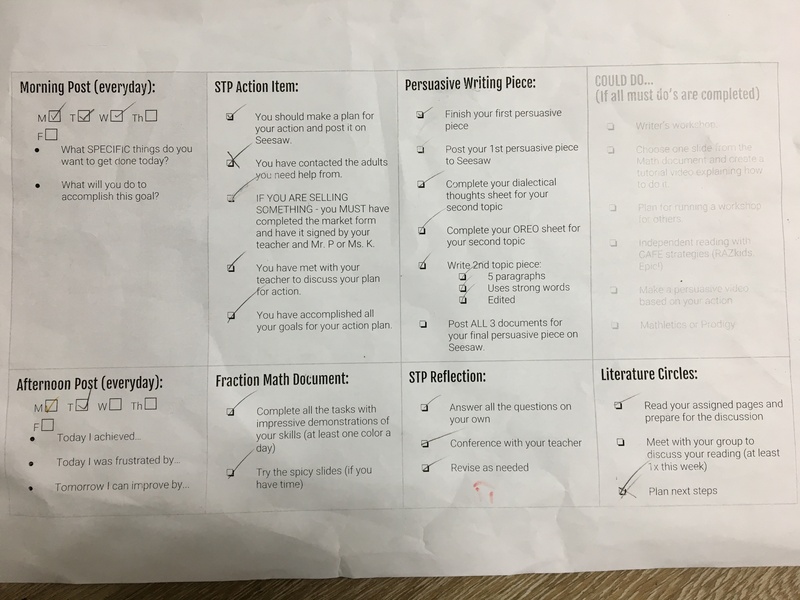 I tried keeping the questions simple – in the morning posting specifically what they wanted to accomplish for the day (thinking if they will be on track for completing everything in the week) and in the afternoon reflecting on if they accomplished their goals, why/why not and what could they do for tomorrow. After the first day, the posts were not where I wanted them to be. As you mentioned, some were being too general (I will work on writing) when I wanted them to be specific (I will complete the planner for my writing today). We need to teach them about how to be reflective, so one of the things I did was put comments on all the students’ posts who I thought could be a bit more reflective, with questions to prompt them to think a bit deeper. Then in the morning I put Seesaw on the interactive whiteboard and as a class we read through some of the posts. We looked at some that were shallow and some that were deep, discussing it as a class. After that, the reflections were much better, but of course there are still some students that find reflecting challenging. In this more open and personalized style of learning, reflecting deeply is incredibly important. If you have some other suggestions on how to get better reflections, I’m all ears! Thanks for the comment. I enjoyed reading your post and was wondering about the WWAITAP unit: did you assess other essential elements, such as conceptual understanding, attitudes etc. during the research skills focus of the unit or wait until they conducted their own personal research? I like the idea of teaching specific skills and then allowing students to show their competence with a personal topic/focus, but I was wondering if this would still be needed even in the last year for some students who are not yet proficient researchers, or if the aim is to try and prepare all students for the kind of self-directed learning in Studio 5. Also, (lastly! ), have you focused each of the five skills during different units, or just at specific moments when you think it is necessary or useful? Westley, thank you for your comment. You ask very good questions and in all honesty I don’t have all the answers for you as this is a work in progress and we are learning as we go as well. Luckily, ISHCMC where I teach, is not only willing, but encouraging us to try new things like this in the classroom. We have not specifically focused units on one set of skills, but have mixed them if we thought it made sense. Most recently though, we have been doing units that have been focused on one set of skills. When I say that, what I mean is that we choose 3 or 4 specific skills under the big umbrella to focus on and explicitly teach and assess for that unit. We have found that trying to do more is too much. Of course that doesn’t mean that students aren’t using other skills during the unit, it is just that we have chosen those to specifically focus on. For example our current unit is on the social skills of accepting responsibility, adopting a variety of group roles and resolving conflict. Students will be cooperating and respecting others, doing research, using self-management skills, thinking, etc… but our focus are those three. This is all new though and finding ways to teach and assess those skills are still being developed, but I strongly feel that this is the right approach as it allows students to do true inquiry. When students get to Studio 5 they are still being taught skills, but their whole curriculum is created by them. Basically they do exhibition the whole year and each student is on their own path. This requires a level of skills in order for them to be successful. I also feel that if students are able to use these skills, it will help them to be successful in the rest of their schooling and in life. In terms of assessment, at the moment we do assess conceptual understanding, but this is open for discussion at ISHCMC. My question is why does knowledge or concepts need to be what we assess? I think that knowledge and concepts are important ways to help teach the skills, but the skills should be the focus… period. I hope that answers your questions. As I said, we do not have all the answers and am open to ideas and suggestions. Please let me know if you focus on skills in the classroom and have ideas on how to teach, assess or anything! I wish I had thought of the skills focused approach sooner! We do focus on them but not to the degree you’re describing. I can see how the concepts/knowledge can be used to develop thinking, research and communication skills, and I will explicitly teach and assess these more diligently as we go forward. Considering that the students are currently working on the Exhibition, I will focus on speaking skills so they are prepared for the final presentation and able to inform or entertain their audience effectively, for example. We’re still following the prescribed PYP plan, to a degree, but the skills will be transferable and there is a real occasion where they practise them and apply them. You have also got me thinking about how we teach language and maths, and how I can create units which focus on thinking and communication skills which go beyond knowledge and application. Hopefully, this will help me overcome the dilemma I find myself in when faced with maths understanding across 3 phases in the scope and sequence. I’ll get back to you when we’ve tried it out! Westley, thanks for your message. I’m glad to hear that you think the skills approach might be useful. I found and followed you on Twitter and you can find me @BillyBillyEdu so we can keep the discussion about #SkillsFirst going. I’d be happy to share resources that we have created to help assess the skills at our level and if you have other ideas please share! We have been assessing knowledge for many years, but assessing these soft skills are different and challenging so any new thoughts and approaches that work would be amazing! You also might want to speak with @OrenjiButa as she has been working on this with me as well and teaches in Studio5 at ISHCMC. She also developed a really great assessment tool called “The Gradual Increase of Independence” (based off the gradual release of responsibility) that we have been using successfully to assess all the skills. It is super simple and the students can use it to assess themselves. Please let me know how your Exhibition goes with the new focus on presentation skills!